to Jews who fell fighting Nazism. 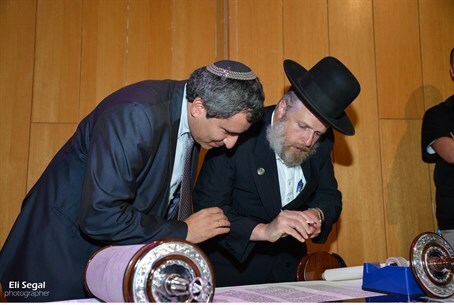 The Knesset saw a rare show of unity on Tuesday, as MKs from across the political spectrum joined Jewish World War Two veterans, along with prominent Israel and European rabbis and other public figures for a special ceremony inaugurating a new Torah scroll. The Sefer Torah was sponsored by the Conference of European Rabbis, in memory of the thousands of Jewish soldiers and partisans who fell fighting the Nazis and their allies during the Second World War. Among the senior legislators in attendance were Knesset Seaker Yuli Edelstein (Likud), Oppoosition Leader Yitzhak Herzog (Labor), Minister of Immigrant Absorption and Jerusalem Affairs Ze'ev Elkin (Likud), and Yisrael Beytenu party head Avigdor Liberman. "This is a powerful expression of the Jewish spirit and courage, both which were revealed in the horrors of the holocaust," Edelstein said. "There is no clearer way to express the victory over Nazi Germany, in all respects, than this ceremony." "This Torah scroll will be... a symbol of the eternity of Israel," he added. Other MKs present were Yisrael Eichler (UTJ), Yinon Magal (Jewish Home), Robert Ilatov (Yisrael Beytenu), Yitzhak Vaknin (Shas), Eliezer Mozes (Shas), Yoav Ben-Tzur (Shas), Yoav Kish (Likud), Yoel Hasson (Hatnuah), and Yoran Mazuz (Likud). Several prominent rabbis were also in attendance, including former Israeli Chief Rabbi and current Tel Aviv Chief Rabbi Yisrael Meir Lau, who also heads the Yad Vashem Holocaust Remembrance Foundation. As is customary, participants helped complete the Torah scroll by writing the last few letters with a special quill. The Chief Rabbi of Moscow and President of the Conference of European Rabbis, Rabbi Pinchas Goldschmidt, also addressed the gathering. "It is possible to commemorate people in a museum - but these things last for a limited time only," Rabbi Goldschmidt said. "In contrast, the commemoration of the Torah is one that lasts for all eternity." Speaking to the WW2 veterans in attendance, Rabbi Goldschmidt added: "In your merit we - and Rabbi Lau - are here today."